George Gartshore was a farrier with the stage coaches and as such he travelled all over the country in the course of his work. In later years he had a blacksmith's shop at the back of the White Horse and his anvil was found there when the building was demolished in the 1960s. 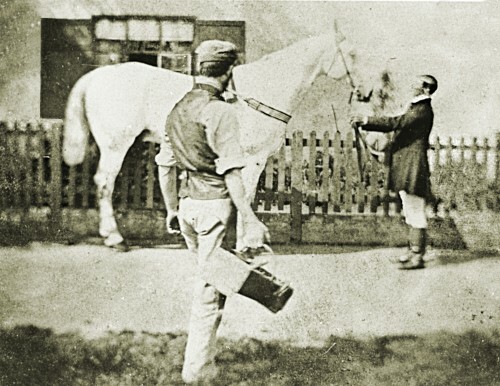 He lived in a cottage opposite Soar House and the photograph shows him having just finished shoeing Lord Lonsdale's horse which is held by a groom. Lord Lonsdale was Master of Fox Hounds from 1893 to 1898. Edward Gartshore, George's son, was farrier to the Leicestershire Yeomanry.